Intend on asking your lover to marry you? Read this article before you pop the question! It was often said that marriage requires a person to prepare four types of "Rings": ‘Engagement ring’, ‘wedding ring’, ‘enduring’ and ‘suffering’! However, this equation could be changed for life. Get your fiancé a radiant cut engagement ring and watch how the “suffering’ part of the equation evaporates with the sparkling radiation emanate by the exquisite ring! By acquiring the radiant cut, the rectangular or square shape of the stone enhances the essence which significantly accentuates colour intensity. Discovered in 1977 by Henry Goss bard, this visually stunning style radiant cut is coveted by almost every bride! It goes without saying that a radiant cut engagement ring made of low quality stone is as good as a vase without flowers. These rings have breath-taking facet patterns on the crown as well as on the pavilion. Many attribute the unique and dazzling cuts as the primary reason why these rings transcend all others. Read on to know about the intricacies of these glamorous engagement rings. The original radiant cut diamond had just 61 facets. The luminosity and glamour of the round cut diamond was first discovered with the creation of this extravagant emerald shaped diamond. Mary of Burgundy had the privilege of receiving the first verified diamond engagement ring from Archduke Maximillian of Austria as a betrothal ring in 1477. However, this was more than 500 years before the radiant cut diamond was invented! A good radiant cut diamond engagement ring typically has a ratio of 1.3-1.5:1 of length to width. One of the most famous radiant cut diamonds is commonly known as the ‘peacock diamond’. These beautifully cut diamond rings are available in a variety of colours. They come in a rainbow of colours varying from pink, black, red to green, and yellow. The metal selected for the ring’s outer setting is customarily either platinum or white gold to effectively highlight the fire and radiance of the stone. The style of the setting can be the more simple solitaire. Ladies feel all the more special and elegant while wearing these treasured stones. Princess cuts are rare and a slightly expensive due to the unique shape and so are pear shape cut diamonds. Radiant cuts are also prevalent amongst sapphire and coloured gemstones. In fact, many prefer these stones not only because they are less costly but because they are spectacular in their own way. In the end, the beauty lies within the technique used by the designer. The corners of these exquisitely cut engagement rings are truncated in such a way so as to trim down chances of chipping. Popularly used for over for more than 20 years, this particular type of engagement ring is considered as the 'father' of fancy cut diamonds. 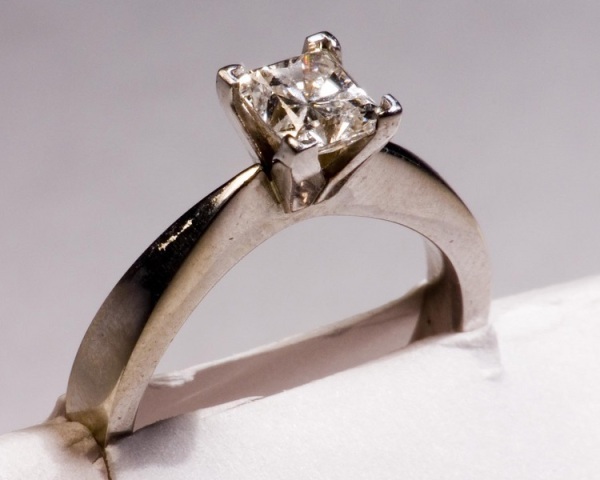 Ensure that you verify the cut, color, clarity and carat weight of the ring before money exchanges hands. The authenticity of the cut can be determined by the sparkle. A diamond with beautiful color and clarity can look dull if the cut is not perfect. It is through the clarity of diamond that one deduces whether the stone is free from any flaws or not. Based on the diamond clarity, the price is calculated. A diamond with no inclusions visible to unaided eye is the best one. Consider all these factors and bask in the glory of eliciting that vibrant smile on your sweetheart’s beautiful face.